9:20pm File room. Adam and Kyra. Adam finds another box inside another box. Sneaky f**kers! Guaranteed there’s more. That’s 254! Unless there’s more. Kyra – yeah. Adam – Motherf**kers! Kyra – and we don’t know when they hid that right? Adam – I don’t know when that was hidden. Day 41 right?! Kyra – yeah. Adam – Sneaky f**ks! Pulled an Adam on an Adam. Probably why Dane left because he knew we were going to start searching. Dane returns. Adam – we just found another one. Did you do that? Dane – no. I wonder why that recorder is gone. Kyra – when did you find it? Dane – yesterday. Day 40. And now its gone. This f**king room is bullsh*t. If this means nothing I am going to lose my biscuit. Adam – nothin’ better to do tonight. Adam and Dane. Adam – I would like to know what the other house guests are thinking. Has anyone said anything about my speech? Dane – no, Esti thinks its good. Adam – are they like whoa!? Because there is no why they are thinking I’m working with Mark. Dane – there’s no way they think there’s an alliance. Adam – not a chance in hell after last week when I said you’re believing the two best liars in the house… basically called you out. I wonder how Canada sees it, like how they’re showing it. They’re probably confused, like what the f**k is real?! Dane -they’re probably showing it like we’re making it all up. Adam – like today when me and Mark were fighting in the kitchen..that was real.. but do they know that. Dane – yeah they see that. Like after the veto ceremony you, me and Anthony were dying laughing. Adam – next person to go up is Anthony. Dane – next person to go up is Anthony. Adam – the next person I call out is Anthony. Adam – if I win triple.. it would be Kyra, Esti, Cory .. and then we decide who stays. Dane – that’s how it should have been this week too. Adam- we’ll be alright.. better be alright. Dane – and we’ve got Kyra too. You have kyra, Anthony and me. That’s all you need. Adam – I do trust you guys 100% but I am scared ..what if Anthony is like f**k it, get Adam out. He’s being a hot head. Dane – I don’t think Anthony would do it. 10:55pm Mark, Cory and Anthony studying the days / events of the season. 12:46am HOH room. Mark and Dane. Mark – I will never forget when you came up here and said that. That was f**king awesome. I want to make a ritual ceremony when we evict the last person … like when it is down to five .. we’re all wearing black and holding candles. And we’re all like remove the spell in some Maki sh*t and blow out the candles.. you’re gone. Dane – absolutely, that would be fun. Mark – this is perfect, he (Mark) is saddling up to Kyra. Kyra loves us. And I need Anthony because he is the good talker. I need to butter them up that the boys are looking out for Kyra. Like Kyra, I really want you in the final 5. Dane – if Adam wins the POV, we should really discuss ..not Esti. Esti is not a strong competitor. And if someone wins triple we are all going to kick ourselves in the nuts. Mark – do not say anything to Adam because he jumps so quickly. Help support OBB by making your Amazon purchases through our link below. It doesn’t cost you anything and we get a percentage of what you buy. Heading to the Liquor store today. 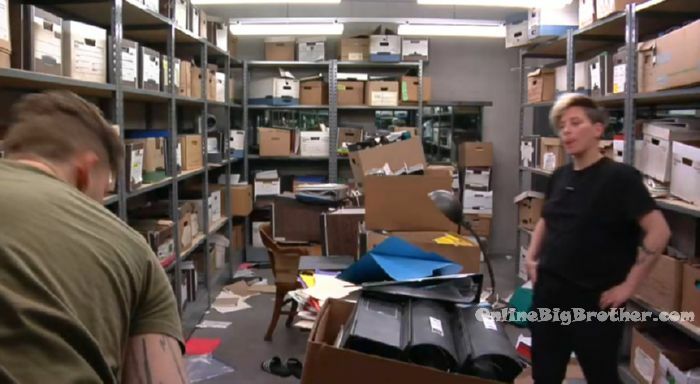 WAS Adam really searching the storage room alone last night, and not using the light he found? After his tour of all the places we were naughty with sam last wednesday…. i don’t think giving Adam a black light is something i really want to see. It’s a shame that this season hasn’t been as entertaining as past season’s. Oh well, here’s hoping that Damien comes down an is replaced with another PB. I’m not going to lie I built a small kraken shrine for Adam this morning. Am i correct in assuming pov players are Adam, Damien with Kyra, Este and Cory (or is it Anthony in that last spot)? 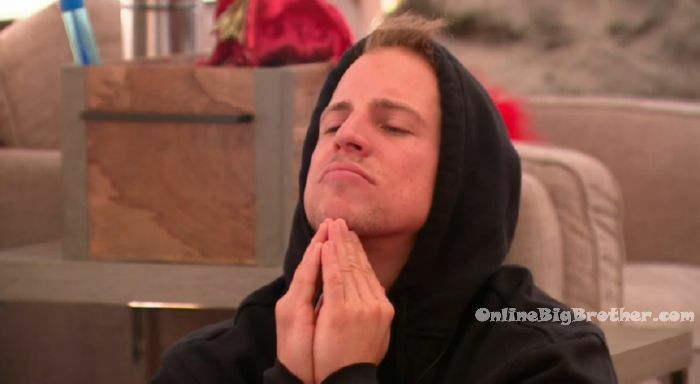 I often tell myself that if i were on bbcan, I’d be the first voted out no matter what the season… but i think season 7 i’d make jury. THAT tells you how Kraken it is. when 5 costumes plus host outfit for pov arrive friday night (as seen on feeds the week eddie was the beaver) but the “veto picks” aren’t made until saturday early afternoon and the size disparity between houseguests is great enough they aren’t going to be able to do one size fits all, it’s valid to say storyline. They think they’re sitting on a 100k cash cow of merch. expecting Mark to be some heroic break the prettyboys from the inside season savior? NO. It’s all Mark making up game in his head that isn’t happening. That was all chat no substance, as marked by his nominations. Putting up Adam alone from the prettyboys was a clear sign that he was NOT actually set on being the d/r character he portrays himself to be. The ONLY way to actually break the prettyboys if you are Mark is to nom two, out the alliance to the house as being real, saying you are nomming them because they labelled you expendable during Sam’s hoh, and saying if one comes down through veto, the sole remaining pb will be replacement. It’s a schorched earth tactic that would ONLY work if Mark had better social ties to the house. Since he doesn’t…. the only plan that ensures the pb alliance has to actually fight to retain power also guarantees Mark’s departure. There is no avenue where Mark (who doesn’t have the social juice to control the vote on an odd voter number week) can actually be the one that breaks the alliance without Mark being public enemy number one (again… due to lack of social currency) and out of the game a week later. The entire premise, in my opinion is propaganda to troll any viewer that wants a dynamic shift in the game. What viewers think of him is a very Mark thing. Let’s be real here: the guy that presents himself as the evil mastermind alliance destroyer is the same guy saying there’s a merchandising cash cow coming their way. Don’t be bamboozled. It’s the ‘at least he tried but nothing changed… so do we give him viewer cred’ premise. Any word on who won veto ? 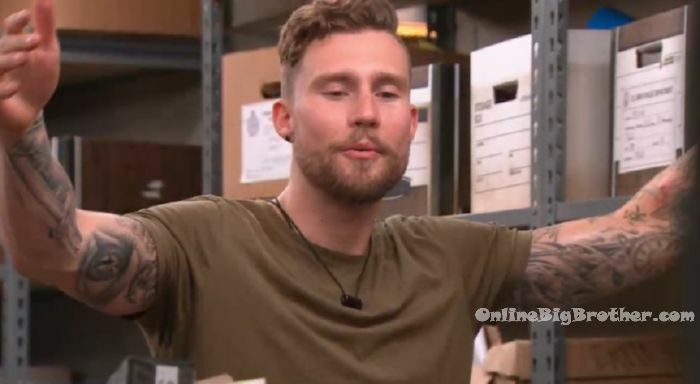 … Adam started the prettyboys alliance; caused chelsea to become target after her hoh by telling the boys what she said to him in confidence; promised to use veto on kiki, then didn’t; told mark, his alliance mate, it would be better if mark stayed on the block so that sam (not in the alliance) wouldn’t have to get more blood on her hands; denied there was a boys alliance to sam; consistently lied to both his alliance and his side piece about their relative safety in the game; is playing just as much a have his cake and eat it too game as either dane or anthony. When do we get to the honest game? Adam is a complete moron. The main reason he is still in the game is that he’s a comp beast.